Nickname Ex. type “GroudonCounter” or “151515” or "MyBaby"
Pokedex Number Ex. type "9"
* “8-24” will show any Pokemon with Dex numbers 8-24. * “7-” will show Pokemon with Dex numbers 7 or above, while “-100” will show Pokemon with Dex numbers of 100 or below. 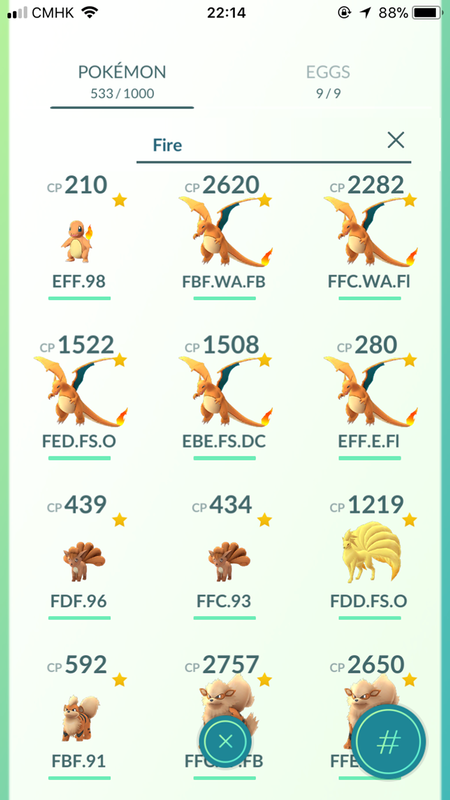 Can Evolve With Item Type “item"
Shows any Pokemon that can evolve when an item is used on them. Shows any Pokemon that's been hatched from an Egg by the player. Event / Costume Type “costume"
Move Type Ex. type "@fairy"
Moves Boosted by Weather Type "@weather"
Species Family Line Ex. type “+dratini” or "+dragonite"
For more in-depth discussion of these searches, including examples and caveats, read the complete article below. Since v0.73.1, the length of the search string can be as long as you like. Your sorting setting (by CP, by Number, etc) will be obeyed when presenting the results. The results will update as you make changes to Pokemon (i.e., evolve). 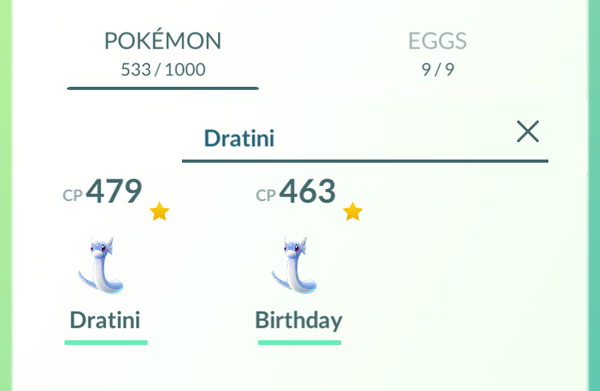 Type “Dratini” and you will see all the Dratini you currently have. 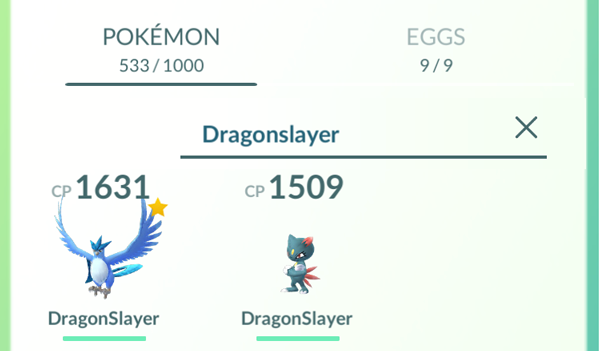 Type “Dragonslayer” and you will see all your Pokémon with nickname “Dragonslayer”. Auto-completion works on both species name and nickname search. 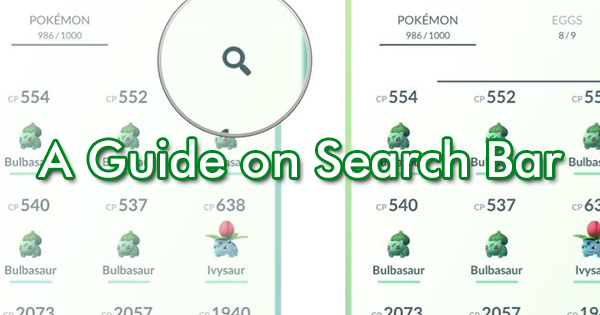 The search will match from the left; that is, if your search is “bcd” while one of the Pokémon is named “abcd”, it won’t show up in the results. 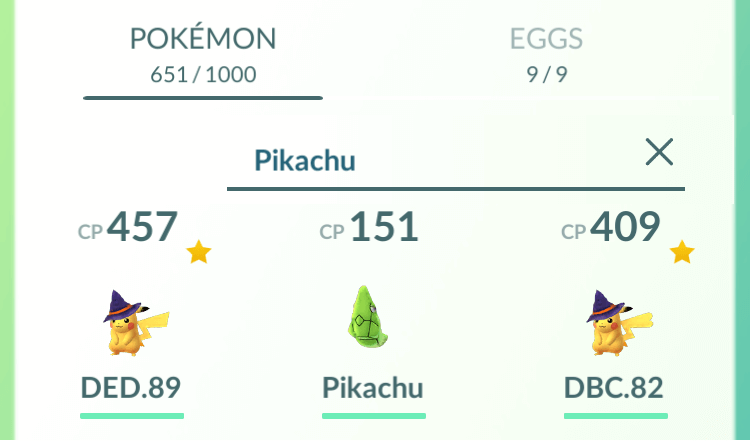 If one of your Metapod is named “Pikachu”, it will also show up in the results of the search “Pikachu”. 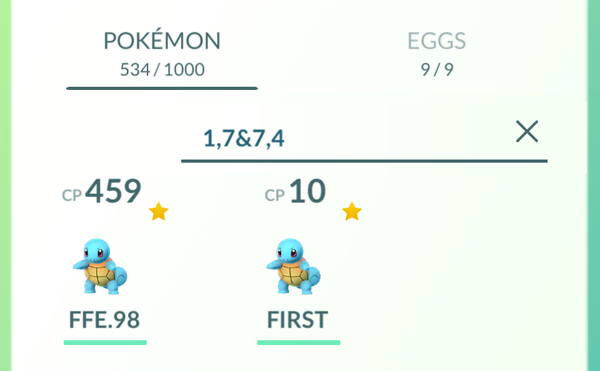 Numerical search overrides basic search - Pokemon whose nickname is "100" won't show up in the result of the query "100". 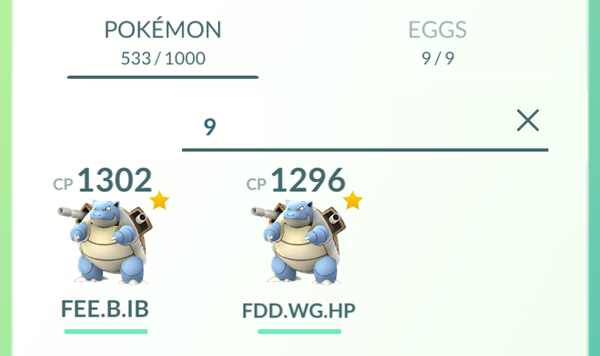 If you just type a number, say "9", the search will return all the Blastoise you have (whose Dex ID is 9). 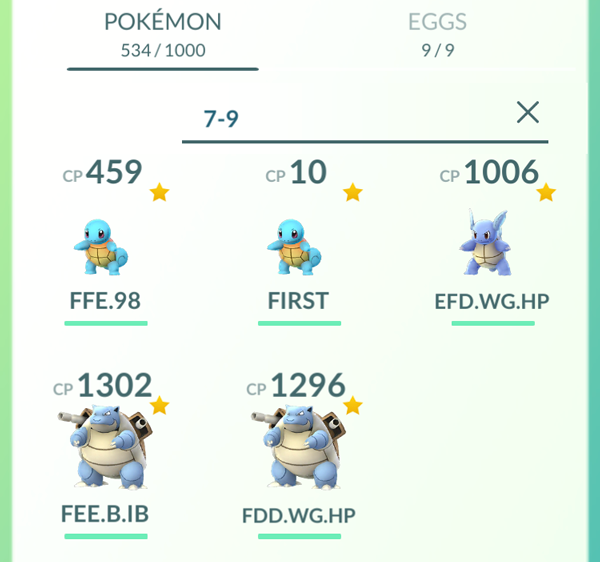 You can also express ranges like “7-9” which returns all the Pokémon with Dex ID between 7 and 9 (both bounds included). It also supports open ranges: “9-” means 9 or above; “-20” means 20 or below. 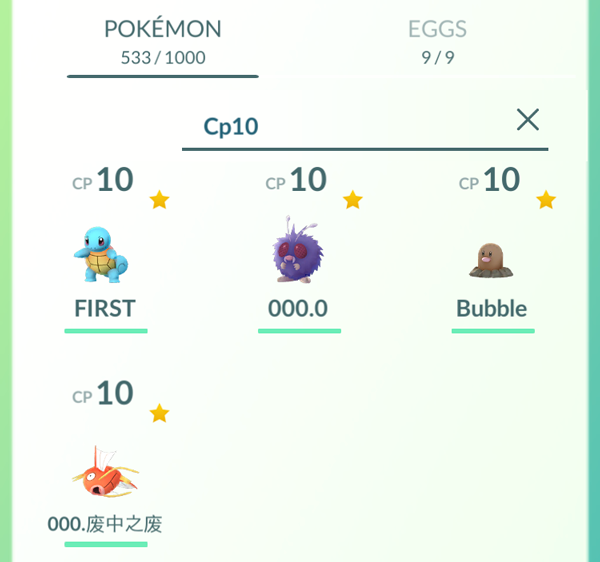 If you put “cp” before a number, such as “cp100”, the search will return all the Pokémon with CP equal to 100. You can also apply range expressions here. 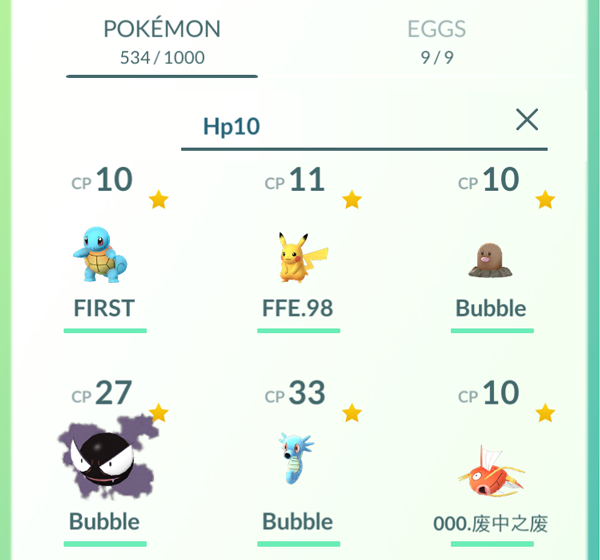 If you put “hp” before a number, such as “hp100”, the search will return all the Pokémon with max HP equal to 100. It doesn’t consider fainted or hurt Pokémon. You can also apply range expressions here. Keywords are special words that correspond to different searching features. 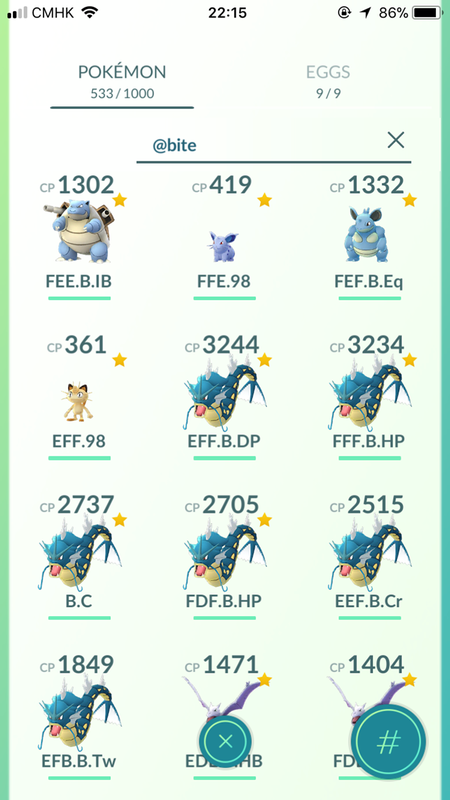 Keyword search overrides basic search - A Gyarados whose nickname is "Dragon" won't show up in the results of the query "dragon" which should only return all Dragon-types. Type “fire” and it will return all Pokémon who is a Fire-type. Both mono-typed and dual-typed Pokémon will match. Currently, there is no way to search mono-typed Pokémon. Type “defender” and it will return all your Pokémon who are currently in the gyms. Type “evolve” and it will return all your Pokémon whom you have enough candies to evolve. Note that even if you don’t actually have the candies to evolve all of them, they will all show up in the results. The result will update as you use the candies to evolve - when you don't enough candies to evolve one, all Pokémon of that family will stop showing up in the results. Type “legendary” and it will return all the legendary Pokémon you have. There are some special symbols that invoke search functions. Special symbol search overrides basic search. "@" refers to Pokémon's moves. You can search by move name: “@bite” will return all Pokémon who currently learns Bite. 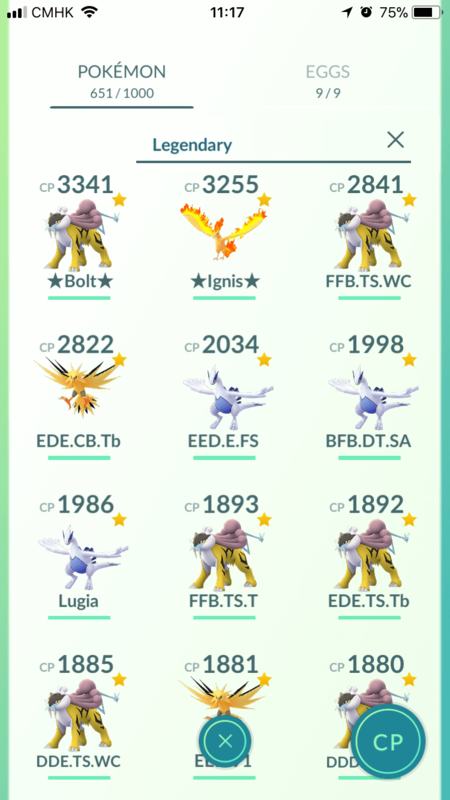 Auto-completion will try to match move name from the left. 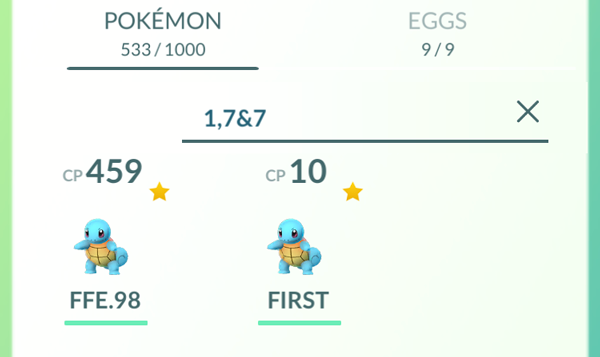 "@" followed by a number, "@n", can be used to pin point one of the Pokémon's moves. "@1" refers to the fast move. "@2" refers to the first charge move. "@3" refers to the second charge move, if any. 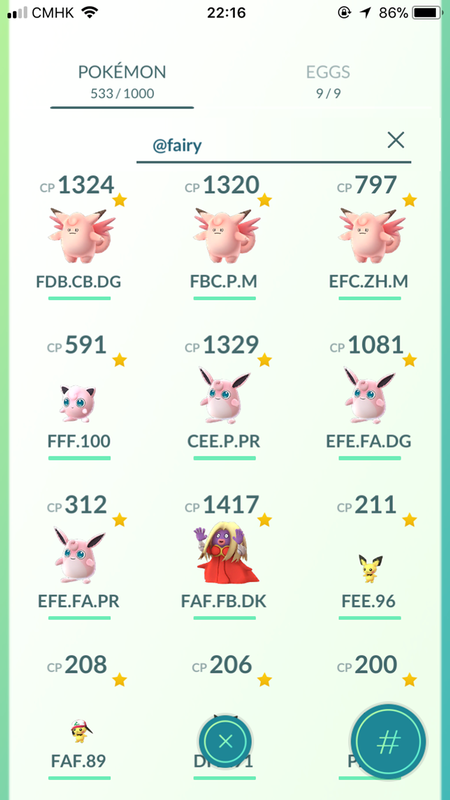 You can also search by the Pokemon type of the move: “@fairy” will return all Pokémon who currently learns a Fairy-type move. Currently, there is no way to specify Fast Move or Charge Move; you cannot search something like “all Pokémon who has Dark-type Charge Move”. 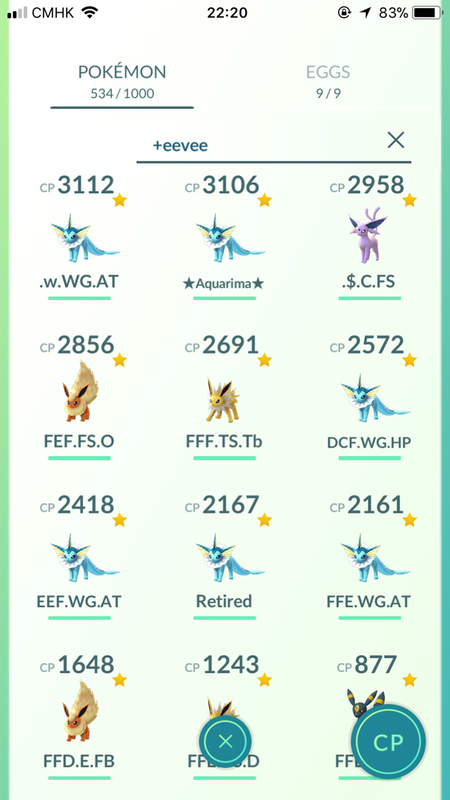 Auto-completion won’t work on Pokemon type. 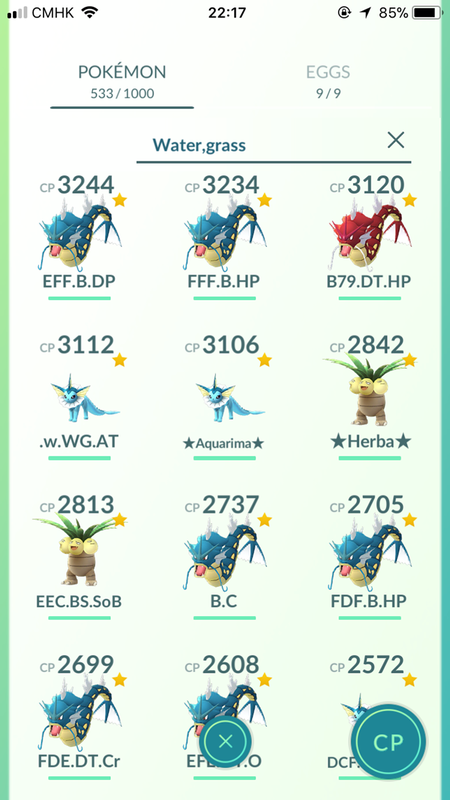 Search by move's name and move's Pokemon type work at the same time. For example, “@rock” will match every Rock-type move and every move whose name starts with “rock” (Rock Smash). 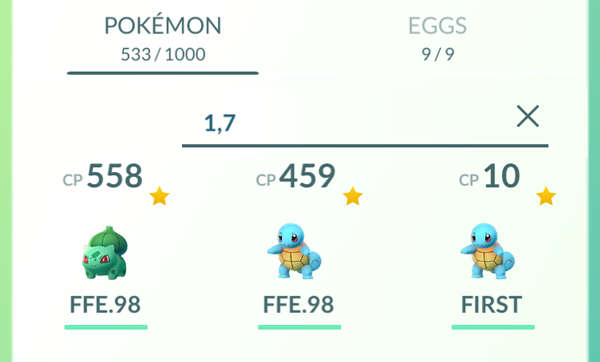 After v0.89, you can use "@weather" to search for Pokemon who has at least one move that gets buffed in your current weather condition. This is rather a shortcut than a new feature - alternatively, you could use move type search and the OR logical operator to combine them. Put a “+” before species name and it will return the whole family. For example, “+eevee” will return all the Eevee and all the Eeveelutions you have. Any member of the family will give you the same effect; “+vaporeon” has the same effect as "+eevee". 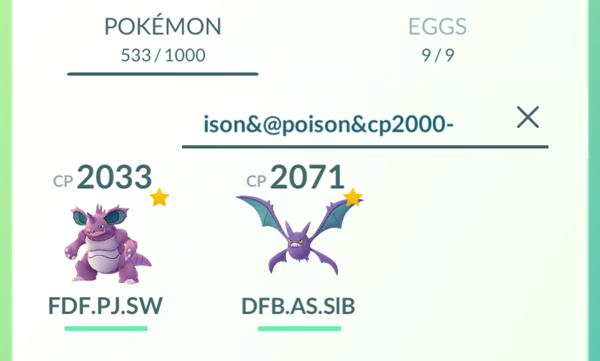 Family search will only work on species name but not Dex ID. “&” and “|” combine search results by returning their intersection. It works like logical AND. For example, “Fire&Flying” will return Pokémon who has a dual-typing of Flying and Fire. You’ll probably see Charizard, Moltres or Ho-Oh. You can use multiple “&” to create complex queries. “Poison&@poison&cp2000-” will return all Poison-type Pokémon that learns Poison move and has at least 2000 CP. “,”, “;”, and “:” combine search results by returning their union. It works like logical OR. For example, “Water, Grass” will return all the Grass-type Pokémon and all the Water-type Pokémon you have. In Pokemon Go, the logical operator precedence (from highest to lowerest) is: NOT > OR > AND. What does it mean? Here’s an example: “1, 7&7” will only return Squirtle (Dex = 7) but not Bulbusaur (Dex = 1). It works like this: “,” is evaluated first, so the intermediate result contains both Bulbasaur and Squirtle. Then the “&7” is applied on the intermediate result and it filters out the Bulbasaur, leaving Squirtle only. This is helpful when we are trying to find something like “all 2000 or above CP Water or Grass Pokémon” - we just need to type “water,grass&cp2000-”. Since parenthesis is not supported, this is a way to work around. For a mass evolve session, the evolve search may show evolvable Pokemon you don’t want to evolve (e.g., you have 500 Swablu candies, but have been waiting for a 98% IV or better Swablu to evolve; or you only want to evolve Pidgeys, but if you have hundreds of Pidgey candy, it would also show any Pidgeotto). 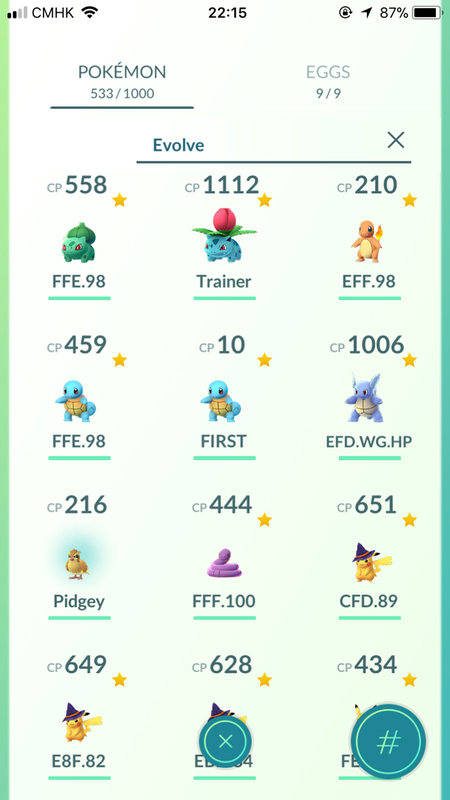 You can save a search string on your phone that only shows you, say pidgeys, weedles, wurmples, etc. and copy and paste it for your session (iOS users may not be able to paste on iPhones and may need to set up Text Replacement. For example, set it up so a term like *massevolve is replaced with the list of pokemon you tend to evolve: "evolve&10,13,16,19,21,23,41,46,48,52,77,84,98,118" (Caterpie, Weedle, Pidgey, Rattata, Spearow, Ekans, Zubat, Paras, Venonat, Meowth, Ponyta, Doduo, Krabby, Goldeen). To make your own list, consult our Pokemon list with Pokedex numbers. The query "[email protected]" returns all Pokemon who has the second charged attack opened.